Hire a wedding band in Surrey to play the biggest rock and pop floor-fillers from the 1950s through to the 2010s. We’ve spent years seeking out the most professional and reliable bands, so that you don’t have to! Contemporary acoustic duo featuring a classy and refined female vocalist, accompanied by tasteful acoustic guitar. Repertoire stretches from Al Green to Oasis. Additional musicians and evening party band also available. What sort of music do our Surrey wedding bands play? Our Surrey wedding bands range in size from 3-piece guitar-based line-ups through to 10-piece show-bands with backing vocals, brass and percussion and play a broad range of rock, pop and soul music. 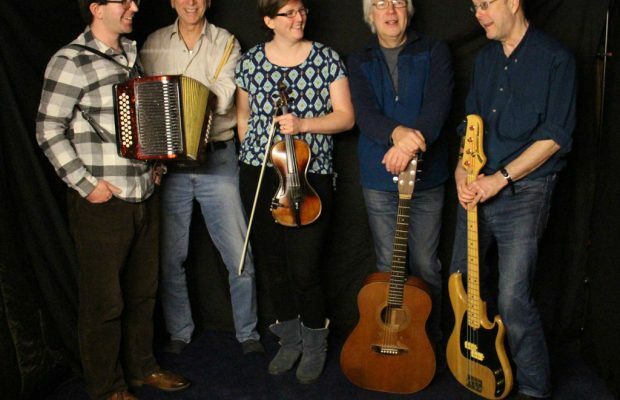 If pop isn’t your thing, you may prefer a Surrey ceilidh band for your wedding – they’re fun and it’s easy to get all generations on the dancefloor. If you’re into swing music, hire one of our Surrey jazz bands. And we don’t just do evening wedding music in Surrey. We can provide musicians for all parts of your day, from your wedding vows right through to the last carriage. Hire a Surrey string quartet or harpist to accompany the bridal entrance and exit, or a wedding singer to keep guests entertained whilst you sign the register. How about a singer guitarist to keep things upbeat during the wedding feast, bouquet-throwing or cake-cutting? If you’re hosting an outdoor garden drinks reception, “unplugged” acts such as a Surrey-based steel band or gypsy jazz trio are ideal, since no power supply is needed. Booking a Surrey wedding band? Our Surrey wedding bands all come fully equipped for your event, though it’s worth getting in touch if you are expecting your event to exceed 200 guests, as extra equipment could be necessary. You’ll probably want a band for after-dinner dancing. Two 60-minute sets starting at 9:30pm is a good schedule to work to when you’re planning your evening. With a standard 30-minute interval half way through, you’ll be looking at a midnight finish. Please note that if the band or their DJ services are required after midnight, late fees can apply. During the break, all of our bands can supply music through their PA system to keep the party going. Some bands can also provide proper DJ sets before or after their performance. All bands will require a soundcheck, a 5pm-6pm arrival time and a 60 to 90-minute soundcheck is typically workable. It is generally best if the performance space is free of guests at this point, but most bands can arrange a ‘noiseless’ line-check to keep the volume down if this isn’t possible. Let us know if you have a request for the band to play your first dance. If the band’s line-up or preparation time mean that it isn’t possible, they’ll be more than happy to play your first dance from an mp3/iPod through their own PA system. For the performance itself you will need to provide the band with a flat and sheltered stage area of at least 3x3 meters for a 3-piece band – add an extra meter per band member as applicable. A raised stage is preferable. The band will also require a power source for their equipment. Travelling, setting up and performing constitutes a long working day, so our bands ask for food and drink at the event. You’ll find specific details on your booking contract. Most wedding bands in Surrey will travel across much of the UK and beyond for your event, but if you are on a budget, consider booking a wedding band that’s local to save on travel and accommodation costs. The location of each band is detailed on their profile. Make sure you’re getting the most of your booking: many of our bands offer extra services such as DJing, acoustic sets or even some smooth background jazz. Check out your chosen band’s profile to see what else they offer. Where do our Surrey wedding bands play? Our wedding bands in Surrey have performed throughout the county, in: Woking, Guildford, Walton-on-Thames, Ewell, Esher, Camberley, Redhill, Leatherhead, Epsom, Weybridge, Ashford, Egham, Staines, Farnham, Horley, Godalming, Reigate, Caterham, Frimley, Cobham and Dorking. Most bands are happy to travel well beyond Surrey, nationally and internationally.